Clash of Heroes has it all: epic storytelling, a wonderful blend of style and substance, and a spectacular battle system. This strategy-puzzler is genre-defining and an absolute must-play effort from the creators of Sword & Sworcery EP. 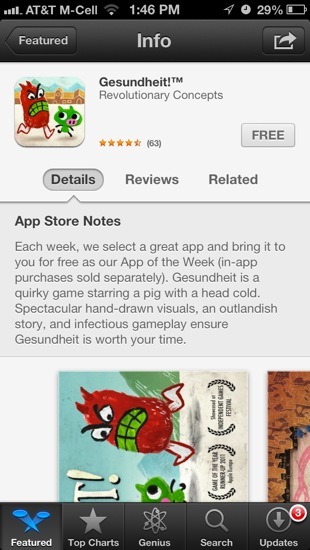 The App of the Week, Gesundheit, which is currently offered for free in the iPhone App Store, features a similar description. Some other apps, such as those found in the "New and Noteworthy" and "What's Hot" sections of the App Store also have App Store Notes, though not all of the apps in those sections have the new notes. Six of 24 New and Noteworthy apps on the iPhone have notes, while the rest do not. Only two apps, Temple Run 2 and Momonga Pinball, on the What's Hot have notes included. App Store Notes might be trickling out to all of Apple's selected apps, or may be reserved for those that are the most popular. At this point in time, it is unclear what criteria Apple is using to determine which apps are furnished with notes, or if it is a feature that will roll out to all curated apps. The new app notes are only visible in the iOS App Store, and do not show up in the desktop version of iTunes. Update: App Store Notes first appeared back in December, for the apps that Apple selected as the best of the year. The feature now appears to be rolling out more broadly to other curated App Store sections. Glad this came out before the new Mac Pro. You guys are the ones that keep the world from going forward. iTunes Store and Mac App Store are theeeee worst tools for discovery ever made. The notes are cool...but I wouldn't exactly call the feature, "innovative." What does this have to do with the Mac Pro? This is about iOS apps. Didn't you see what happened to Apple's stock price lately? Apple is low on market cap, they had no choice but to take one of their few hardware engineers off the new Mac Pro and start teaching him how to code html so he could create this little feature in the App Store. I'm sure he'll get back to work on the Mac Pro soon though, right after he's finished his Genius bar shift. If we assume your comment is sarcasm, then you're suggesting that every little update Apple does these days needs to be a major innovation? And if we assume your comment isn't sarcasm, then you have set an excitingly low bar for what you consider innovative. This forum has just turned into a big whining fest. I don't see how a tech company can make your lives so miserable that you are compelled to cry about every article macrumors puts up about Apple, good or bad. Go out and enjoy life, you only have one shot at it..
wow some people are resistant to sarcasm..